Twelve-year-old Aspen Kelly has a special request for her upcoming birthday: postcards. The girl from Oklahoma will become a teenager on September 1, but she can't celebrate the way she wants to. Aspen has leukemia, and "she can't really do anything or go anywhere for her birthday like she used to," her mom, Vanessa Kelly, wrote on Facebook in July. Since she can't travel, Aspen made a request for postcards from all over the country and around the world — and her expectations were far surpassed. Even a famous actor sent Aspen a special card for her birthday. Vanessa Kelly first shared Aspen's desire for postcards on Facebook last month, calling it a "birthday request for a fighter." "She is hoping that maybe people can send her a post card from where they live in the United States or all over the world. She would love to see a beautiful place, or something cool and exciting from other places she's never been to before," Kelly wrote. "It would be awesome if we could get one from each of the 50 states and 6 of the continents. Not sure if Antartica is an option, lol," the mom continued. She included a PO box address and said she would save the postcards and give them to Aspen on her birthday, September 1. Little did she know, hundreds of people would share her Facebook post, and Aspen would be sent an overwhelming number of postcards. In fact, she didn't just get one postcard from each of the 50 states, she got over 1,000 all together from every state and 49 countries, Kelly told CBS News via message on Tuesday. One postcard came from Greece, but it wasn't the distance it traveled that made it impressive, it was the person who sent it. "This postcard is too awesome not to share, and I'm totally geeking-out right now!" Kelly wrote on Facebook Monday, about a month after she originally posted her plea for postcards. 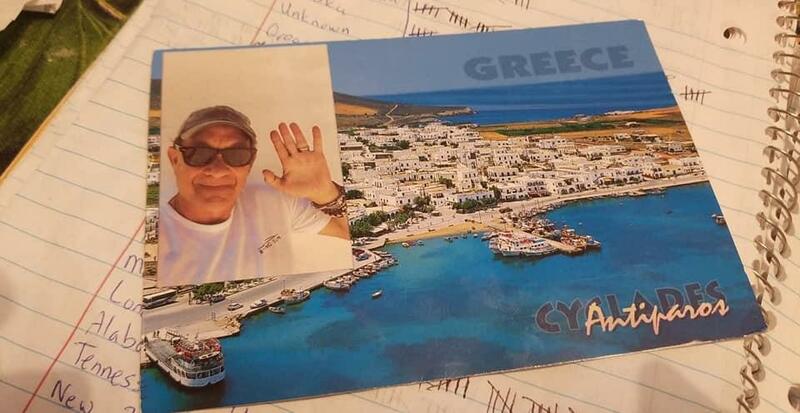 "Tom Hanks took the time to send Aspen a postcard from Greece!" The mom explained that at first she wasn't sure it was really the star who sent the postcard, but they compared his writing to a fan letter they saw online and it matched up. They also learned that Hanks is indeed in Greece right now. "Thank you so much Tom Hanks for taking the time to send Aspen a postcard!" Kelly wrote. Kelly shared a photo of Hanks' card, which shows the sweet note he wrote Aspen: "I hope this arrives in time for your happy 13th birthday! Love you." Hanks' postcard for Apsen exemplifies the power of social media — her mom's Facebook post managed to travel across the Atlantic and reach a famous actor on vacation. Aspen not only received a card from the Oscar-winning actor, she also got one from a politician closer to home: Oklahoma Governor Mary Fallin. "I've been collecting them and storing them in a box until Sept 1st. But then this one came today and she couldn't help herself, when the Governor of Oklahoma sends you a card in the mail, you open it," Kelly wrote on Facebook, with a photo of Governor Fallin's card. It seems Aspen will get her wish of seeing the world for her birthday, even though due to her cancer treatments her sightseeing had to be in the form of postcards. Thanks to generous social media users — and Tom Hanks — Aspen's birthday will be a little bit happier.